I’m very happy with your services. However, my last name is Noblin, not Doblin. Great service. Luis does a fabulous job. Service with a smile. I am very happy with your service and Jon is terrific, very professional and thorough. I am pest free thanks to your service. I highly recommend. 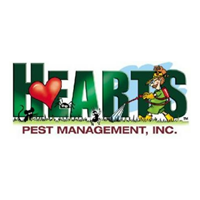 We started using Hearts Pest Management shortly after buying our house almost five years ago. We use both their squirrel and gopher services. Hearts has been very reliable about calling and telling us when they are coming, and keeping their schedules. Their squirrel bait has kept the population under control even though our property abuts a very large open space where the population is uncontrolled. They have also been very reliable looking for and finding gopher tunnels when we[point out new activity. Service is great and techs are very respectful and courteous. Would be 5 stars but sometimes one of my out buildings didn’t get sprayed for some reason. I am very happy with the service. Jonathan is our technician... He is very professional, courteous, and knowledgable. Well I spoke to your office person a few times and she was always very nice and did a good job and the service technician arrived on-time kept in touch with me beforehand. He was knowledgeable and he did what he said he would do and the results of his service is yet to be seen. Couldn't ask for more - Jon is very thorough. Also kind and polite . . . .you are lucky to have an employee like him. Like the service very much. Very professional and always asks if we have any special concerns they need to address. PLEASE DO NOT SEND THESE TO MY PLACE OF EMPLOYMENT. Very accommodating. My husband keeps forgetting the day and has to reschedule and Jonathan has no problem with doing that. Thank you. Thanks. You guy rock. No moe gophers tearing up my new lawn. Appreciate your efforts. I'm totally happy with your service. I would give a 5 star review, except the technician doesn't always remove spider webs from the exterior of the home. The technician was friendly and the products he used seem to be working. The amount of pests is almost zero and is decreasing day by day. So far our service has yielded great results. There's still work to be done, but they were very clear on calling them after letting the product work for a few weeks. I think after a few treatments we will definitely be rid of our problems and look forward to working with them. Great people, always on time & very knowegable. so far your service has been great, so happy we switched over to your Company. Gonna have to give notice for no more service. Have always had a problem with spiders and spider webs. Even with spraying and a couple times of extra appointments the problem still exists. So this will be the last service for us. Jonathan is great, just still had problems with ants in upstairs bathroom, hope this last time works. Visit went well. Too soon to evaluate effectiveness of product but technician was knowledgeable, helpful and pleasant. Jonathan is always unobtrusive and quickly get his job done and is friendly when I know he is there LOL. He even brings treats for my dogs. Hearts did a good job controlling the rats and ants in our Alpine home. I give them a thumbs up and would recommend them to you. My technician was professional, personable, and punctual! I've used Heart's in the past and have always been satisfied with the services provided. We are very happy with the service from your company. The company is easy to work with, friendly office staff and technicians and reasonably priced. Technician was very polite and listened when I told him where I had spotted ants.